basic five elements; Space, Air, Fire, Water and Earth. and often faster results for healing our personal body and mind type. 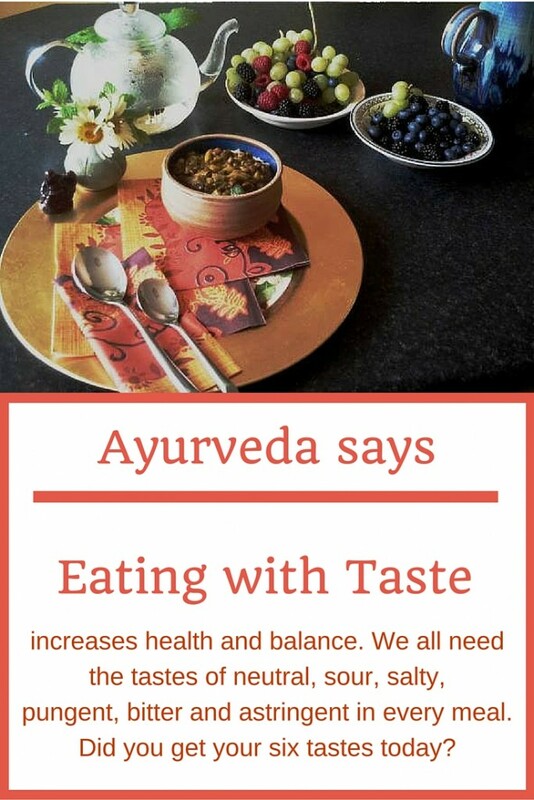 Eating with taste, the Ayurveda six tastes, is one of the first steps for inner healing, with choices you make. Let your food choices be your daily medicine. So how can we achieve balance in our choice of foods? This information gives us the knowledge of how our body type can show as balanced or unbalanced. Working alongside an Ayurvedic practitioner or therapist is always advised to receive the gentlest and best way into balance. if there is excess movement, like a twitch or alot of giggling, or the mind over active, this is Vata moving high. Or Pitta, if there is excess heat/bile in the digestion, we could get acid reflux, ulcers or indigestion with heat. Or for Kapha which translates into phlegm, so we could get a sinus problem or a build up of extra tissue or weight. So if we have an imbalance, or want to tweak our diet for maintenance- we need to apply a rule of Ayurveda to our food choices. Eating with taste, or following the Ayurveda six tastes, allows us to work out what food types will increase or decrease our imbalance. Below are the attributes (what is within each) of each dosha and what types of food could help reduce imbalances. toxicity. Once we can remove some of the toxins, balance is a step closer. For further detailed information on Eating with taste or the Ayurvedic six tastes click here. Note: Ayurveda considers food as medicine. Be discerning when changing your diet. Offer alot of respect and awareness to how your body feels inwardly and as a whole functioning system. These tools work and it is always best to work alongside an Ayurvedic practitioner or therapist to receive guidance and education.